This example of 1886 1c positions 29, 39, 40 with perforated CANCELLED. Has any member any information about this? The perforated CANCELLED is well known though not common on early issues of NB printed by Blades East & Blades. It occurs on SG1 usually over 3 stamps and I have it up as far as the large $5 SG 49. It is well written up in Samuel 1976 Specimen Stamps of the Crown Colonies page 183 and also mentioned several times in Shipman North Borneo Handbook volume 1. 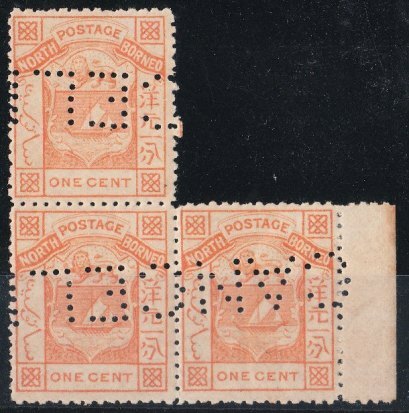 It was applied I believe by Blades before distributing their stamps as samples but Samuel does not give it specimen status as he believes that they were not sent to the UPU and of course in fact predate North Borneo membership of 1891.